You need to look at the NOAA forecast. I kind of trust NOAA over all the others. Mountain-forecast has always over-estimated the snowfall. ...Of course they could be right once in a while. The snowfall will be light. Even if there's almost a foot, you can tramp through it and pack it down. That will slow people way down, though. Microspikes might come in handy. But the trail will still be navigable, if the cold doesn't convince you to turn back. 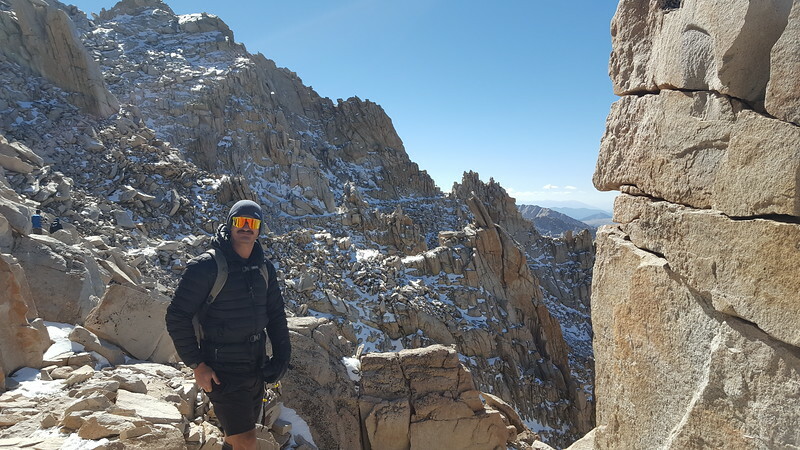 As requested, the trail conditions on Mount Whitney Trail on Oct 4th after the first storm of the 2018-19 wet season. First snow and thin ice encountered on the trail at 11000ft. The ice dissipated by trail camp and snow accumulation increased to about 3-4 inches by the cables on 97 switchbacks. Snow depth remained consistent until Trail Crest where the depth increased to 5-6 inches in some spots where it was not packed down. Snow depth at the summit was 6-7 inches with small drifts of about 10-12 inches. That's all fine a dandy but just remember one thing. All the snow melt and slush will freeze tonight and on the 5th there will be a lot more ice from the cables on up to the summit. What is the water situation like at this time up at Trail Camp? Hoping everything is not frozen over. Heading up this weekend. Any help is appreciated, thank you! If the pond has ice on top, it will be easy to break the ice to get water. However, if you are carrying a water bladder for your drink, the tube can freeze, so bottles carried inside your pack might be better. "October 7, 2018 Welcome to the winter hiking. We had snow and some slippery ice from the switch back to the top." Any idea when this last picture was taken? I know it says posted on Oct 7th. Wondering if the picture was taken on the same day...seems contrary to a previous poster who said that most trail snow had melted away. Hiking on Thursday 10/11. Was hoping for better trail conditions. Overnight on 10/6, a small storm went through, and dumped more snow. Note the Williamson webcam tonight -- it shows the coverage there on the morning of 10/7, showing new/fresh snow. It is likely that by 10/11 lots of tracks will have packed down the snow, but you should take crampons or at least microspikes to make the travel easier. OK. Thanks for the update. Much appreciated. How were conditions on 10/11? Heading up 10/17. Would love an update and perhaps a picture. Thanks! Hike was awesome. Trail conditions were fine. No trail snow until the middle of switchbacks. We didn't need to wear the micro spikes going up. But we did wear then coming down. Back side of trail had more accumulation, but was still accessible. Sumitted at 0930. Weather was perfect. Clouds started rolling in at 1030 but never got above trail crest. I wouldn't even call the amount of snow fall a dusting. Just specks of it. Would attach a couple pics, but I can't seem to figure out how. Here's one: West side view. Congratulations on the day and thanks for the report. Much appreciated. MoLea posted a good trip report here. Picture of the JMT / Main Mt Whitney Trail junction, just west and below Trail Crest. Picture posted on FB by Inyo SAR member Ed Carlson, provided to him by Alec D.
Depending on temperatures, that snow can turn slick and icy. Traction devices will definitely help. May be mandatory. Got to Whitney Portal campground after picking up our permit on 10/16. Heard a lot about camping with bears and the aggressive nature of the bears at the campground. Sadly, didn’t see a one. Loved the campground. Good sites and easy car camping. I would highly recommend staying at the campground versus down in Lone Pine. You are probably at 8K feet versus 4K feet so it helped us acclimatize. Plenty of water. Firewood available. Bathrooms are clean. Note that I said firewood - it’s is starting to get pretty cold. We went to bed with temps in high 30’s. Whitney Portal store is running at odd hours given off season. We never got in there but we’re prepeared with food. From everything we read, that store is pretty stocked and the burger after the hike is rumored to be legendary...if only it had been open. To the hike - two dudes in their late 40’s. If you read the post from the Reno couple, we strived to be as awesome as them. We did a fair amount of training. I was running a lot at sea level (I live in Houston) and my partner was doing lots of hikes around LA. We did one training hike up to Mt Baldy, which was a good way to get a few miles in above 10K feet. We paid a lot of attention to this message board and the webcam shots and the weather forecasts. We found them to be great resources. By all accounts 10/17 was going to be a epic day. Forecast at the Portal was low in the 30’s. Forecast at the peak was highs in the 30’s. No wind. It did not disappoint. We got a tad cocky about getting up early. Most people talk about being on the trail at 3am. We thought that was a bit early. It ended up being a mistake going back to the randomness of the portal store’s opening. Trust it. Leave at 3am. We got up at 3am and left at 4:30. 20 pound packs. Gear for cold, microspikes, poles, 4.5L of water. Headlamps all the way to Trail Camp. We tried to keep a reasonable pace - 2.5mph, which felt kind of slow. The hike to Trail camp is pretty easy relative to the rest. Maybe 6’ish miles. Not too steep. Easy to stay on trail. We could’ve pushed harder but were worried about what was ahead. Stopped at trail camp as sun was coming up. Great views. Frigid. Super cold. No clue what the temp was but I took off my wool gloves and hat for the time it took me to open my pack and they froze solid (wet with sweat). Someone suggested handwarmer in a post. We had them and used them here. It was a great call. I honestly thought one of us might get hypothermia. Can’t believe people camp there. Thankfully, movement and Mother Nature kicked in. Sun came up as we hit the switchbacks. Loved the warmth of the sun. Hit the switchbacks to the cables without microspikes. Put them on there and they stayed on for a while. Surprised how many people did not have any traction and went all the way up. Maybe we were conservative but the cost of a mis-step seemed pretty severe and they were suggested so we went with them. Switchbacks were more of an endurance walk than anything hard. Lots of people. We chatted folks up. Enjoyed the sun and camaraderie. Even saw some guy take his pack off and it went tumbling down. Saw writing in the snow later that he had found it. Got to the gap after switchbacks before John Muir Trail intersection. Don’t know what it’s called but it was sunny and a good place to stop and grab a rest and food after switchbacks. Took off microspikes here but shouldn’t have. Put them on pretty quickly later. Sunny. Bluebird day. NO WIND. We had amazing conditions. Pushed on to summit - the famous 1.9 miles that takes 2 hours. Believe it! I am not a great fan of heights so this part was a tad outside my comfort zone. The windows are awesomely terrifying. The trail was both technical - big boulders and ankle twister holes- and icy. We were in and out of the microspikes. It was a pain but we wanted to stay safe. The way down, we just focused on being smart and not going too fast. The two miles to JMT is just as tough down. Just boulders and height and ice. Maybe we are wimpy. Switchbacks down with microspikes were very nice. Just never ending. Trail camp to Lone Pine was beautiful. We had passed through there in the dark so we got to appreciate that. Then on down to the Portal. We focused on drinking lots of water and eating food - even though neither were appealing. We both felt pretty good when we got done at 6pm. All told 13.5 hours and almost 23 miles. Commentary - passed, interacted, saw a lot of people along the way. Tried to be good trail dudes so always said hello, how are you doing, etc. That totally made the experience better. Saw most of them along the way multiple times. Sometimes in trouble - all elevation derived - so we’re able to give people food or water or tums (old dudes that we are). Many of them struggled immensely with the altitude. Didn’t make it. Ended up in hospital. Be careful. Some folks handle the altitude differently. Don’t make bad decisions. Drink water. Eat. We also saw a lot of them down in Lone Pine the night we finished and enjoyed a beer. Fun to hang with kindred spirits. What else can I tell you - we carried our water 4.5L - but brought tablets. We did fine on what we brought. Probably took too much food but, as mentioned above, were able to give to folks who needed it. We both went with solid ibuprofen plans. Starting the day before through the night we finished. Amazingly, neither one of us were sore after. I had one heel wrecked from blisters but what can you expect. I hope this is helpful. So many other posters have been to so helpful in our preparation. Howdy y'all, reading all the trip reports over the last couple weeks I have a pretty good idea what the main trail looks like. But anyone know what the mountaineer's route looks like right now? Best I've been able to gather is the chute is clear and the north side of the summit is snow covered. Sounds like similar conditions to my climb a couple years back but don't want to underestimate the late season conditions. I am searching for any MR current conditions too. Planning to be there first week of November when no permit (with quota) is required. Would appreciate any latest trip reports of MR.
What is the condition of the water sources? Are they frozen? What is the last available water? As for the Mountaineers Route, I would expect you will find snow in places about like the picture posted above on 10/09/18. Nothing much has fallen since that storm went through. I am sure there is some snow in the chute. You definitely will need crampons for any ice-covered places. Benski: The pond at Trail Camp may ice-over, but you should be able to break the ice and get water. High temps at Cottonwood Lakes are in the low 40s, and that's 2k elevation lower. Confirm Steve C’s comment on water. Froze at night and in the mornings. Thawed out when sun gets on it. Easy to break through and get water. Lots of hikers on 10/17 minimized their weight and filtered as they went. Not sure what sources, if any, are available after trail camp. Plenty below trail camp still flowing. Generated in 1.197 seconds in which 1.185 seconds were spent on a total of 14 queries. Zlib compression disabled.